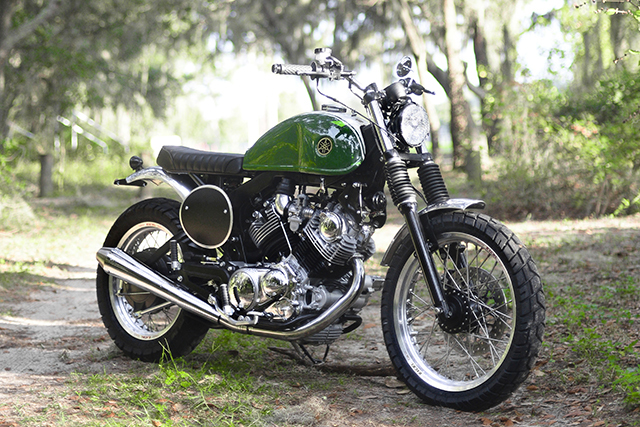 In 100 years time when they write the history of the current custom motorcycle renaissance that we are living through you can be sure that Greg Hageman will be one of the leading names credited for spurring the revival. 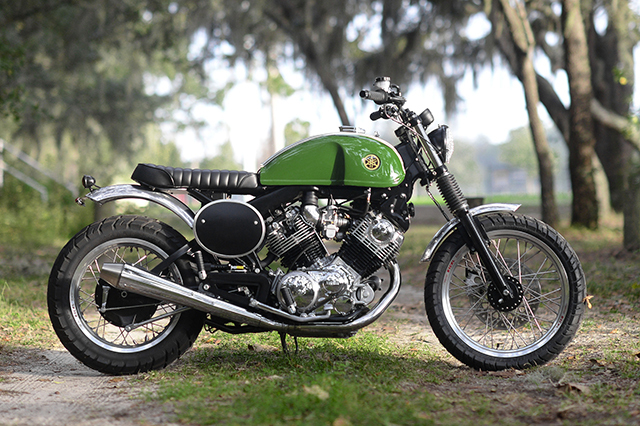 He can turn out a mean Harley, cafe a Honda and build just about any style of bike but it’s his incredible work with Yamaha Virago’s of the early ’80s that have really won him acclaim around the world; from magazine covers, to TV features and the trophies to match. But not only has Greg inspired a new generation of XV builders keen to tackle the old V-Twin he’s also produced a range of quality parts for his fellow customisers and without him leading the resurgence of the models popularity you have to wonder if the all new Yamaha “XV950” Bolt would ever have eventuated! 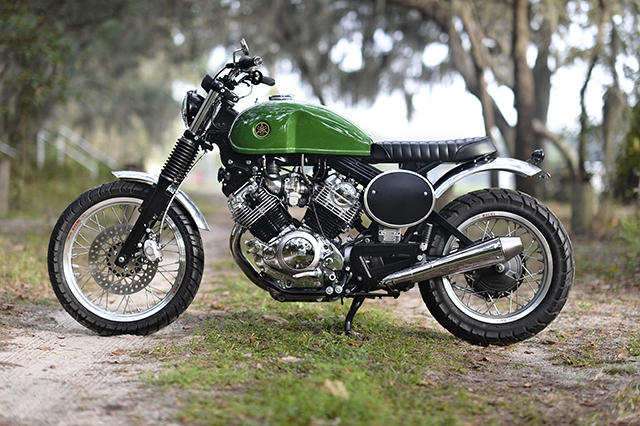 It was no surprise that when the Bolt was released and Yamaha arranged a build off between ten workshops that Greg took out the top prize with a vintage scrambler take on the all new XV. This latest build however is a little of the old and new, based on a 1982 Yamaha XV920 with a modern twist, the running gear is taken from a 1998 XV1100. “This bike was built for the perfect customer, someone who was more interested in performance, function and reliability than budget. 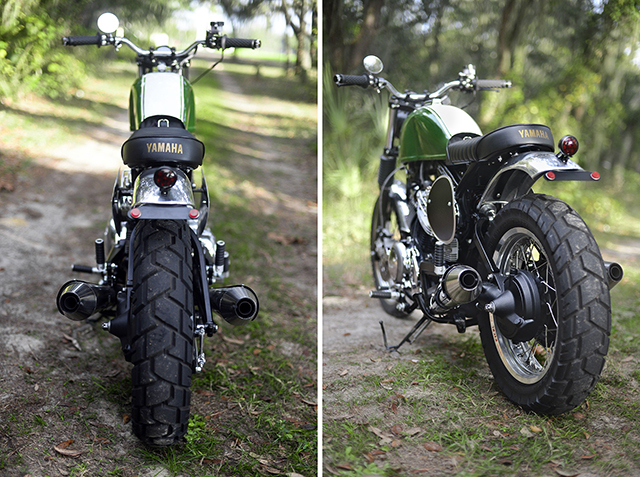 He asked for a classic scrambler look that would mainly be ridden on road, but have the ability to occasionally stray off into the back pasture to check on his horses,” explains the main man from Hageman Motorcycles. Greg’s bikes are always picture perfect, like something you would expect to find on a new bike showroom floor, so the 82 frame might be thirty odd years old but you’d never know now that it’s had the Hageman treatment and is finished out in all black. To let the paint work really stand out the front and rear fenders are not only exceptionally practical but have been polish to a brilliant shine. 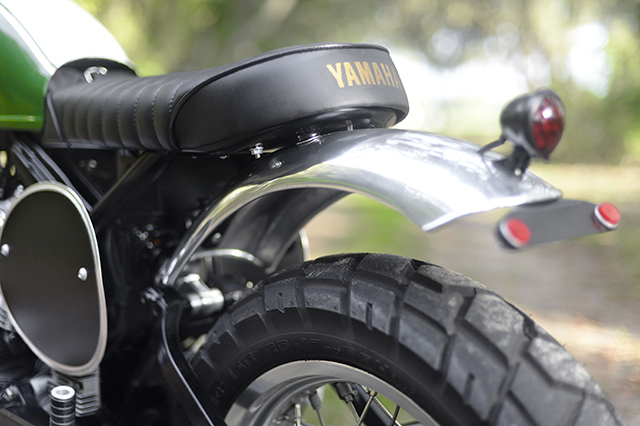 The addition of racing side covers is another Hageman signature that gives you more than a subtle hint of the inspiration of this classic Scrambler. With the Green Machine now looking a treat it was over to functionality as Greg’s bikes are built to ride and the suspension has come in for a thorough overhaul. The stock forks are swapped out for a late-model HD entire 39mm front end. Not stopping there the forks have been rebuilt with improved springs and preload adjusters. Out back the unique in frame mono-shock has been swapped out for a Hagon unit that also features a remote adjuster. Arresting forward momentum is done courtesy of a single drilled disc rotor up front and the beefy Yamaha drum at the rear. 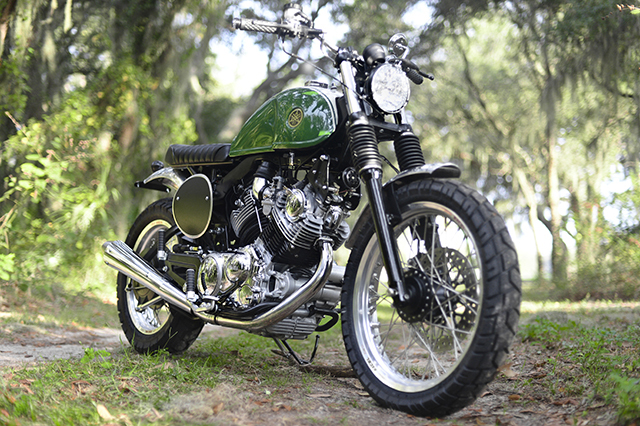 With the major components taken care of Greg spent a good deal of time piecing together all the little parts of a motorcycle that turn a custom into a truly functional machine you can ride daily. 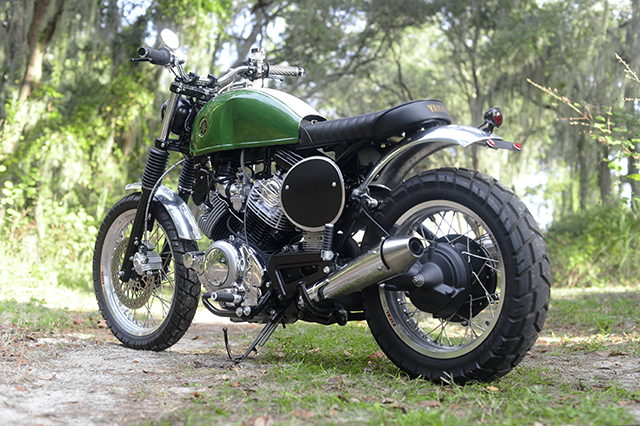 “I added a Motogadget M-unit, Motogadget bar end turn signals for the electrics. 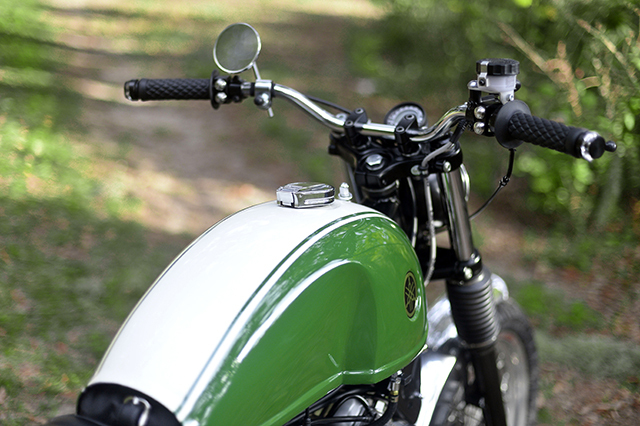 The Speedo is Acewell, I like the simplicity of using and installing this speedo.” The flat track bars keep the look spot on and with just the small Motogadget switches, master cylinder and a single mirror result in an extremely clean look that is still utterly practical. 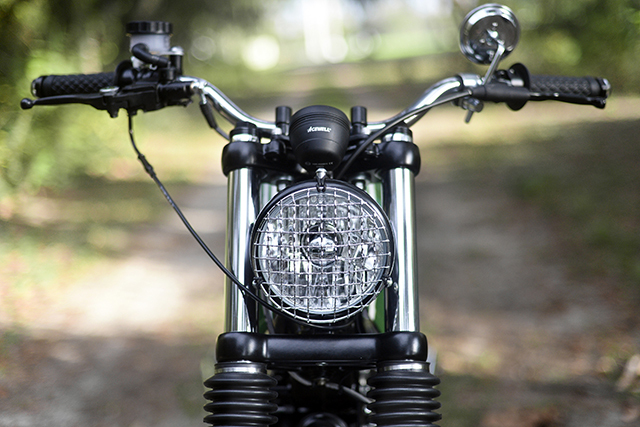 The headlight gets protection from a mesh stone guard while an old school taillight sits out the back on the rear fender. There is passenger fold up foot pegs for the pillion and Greg put in special effort on the riders peg placement, as the customer is 6’4″ and wanted a comfortable ride that was still sporty in nature. Finishing up the build are the excel alloy rims with stainless spokes that have been laced to the standard hubs. Rubber comes courtesy of Kenda dual sports “less aggressive since it’ll spend the majority of time on the pavement.” Which is yet another reason a Hageman build is such a work of art; they look good enough to enter any show and take home the trophies, yet never compromise on being a useable motorcycle. “The bike runs, rides and handles very well, mission accomplished. The bike is most of all, very fun to ride, comfortable and dependable unlike so many customs on the market I see being built today. 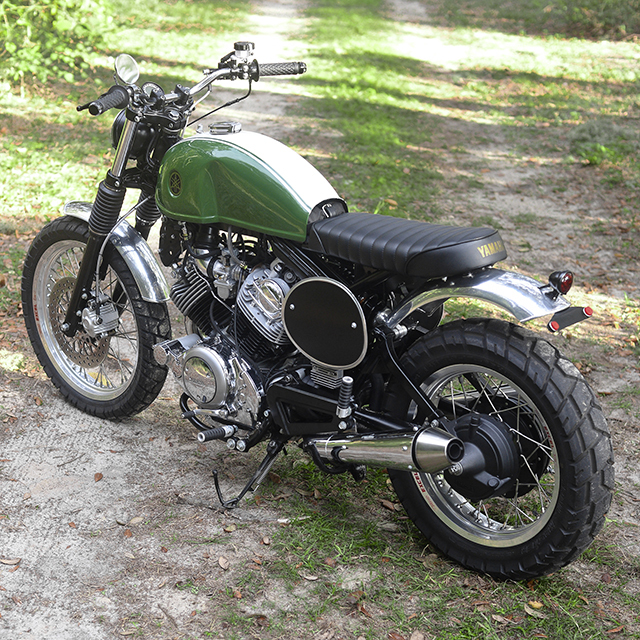 I like to emphasize both functionality as well as the cosmetic look.” Greg’s longevity and success is simply a commitment to delivering in every area a motorcycle should, with no corners cut and an end product straight from the top shelf!